Scotland Head Coach Grant Bradburn has given his backing to a brand new coaching programme which aims to turn cricket into one of the country’s mainstream sports. All Stars Cricket aims to inspire five to eight year old children to take up the sport through a fun first experience of the game. The Cricket Scotland eight week programme begins in May and will see participating boys and girls develop their skills and make new friends in a safe and inclusive environment at one of the more than 50 Scottish cricket clubs who have signed up to host and run the sessions. Bradburn was present at a taster session held earlier this week and the New Zealander said: “I have been involved in a number of similar programmes back home and the ‘pick up’ has been very encouraging. “With so many different sports trying to grab kids’ attentions now and other pastimes, cricket has perhaps not always sold itself as well as it could in the past. “From what I have seen from All Stars Cricket it certainly ticks a lot of boxes and there is no doubt that kids will be heading home after these sessions with a smile on their face because there is something for everyone. Registration is open with each child receiving a pack of cricket goodies including a cricket bat, ball, backpack, water bottle, personalised shirt and cap to keep so that they can continue their love of cricket when they go home. The programme is launched on the back of statistics which show just two per cent of UK children aged seven to 15 named cricket as their favourite sport, and three in five youngsters did not name cricket in their top 10 sports. Ian Sandbrook, Director of Participation at Cricket Scotland, said: “We believe All Stars Cricket could be a game-changer for the sport in Scotland. “We think the programme will provide children and their parents with an outstanding first step into the sport and help create a generation of youngsters with a lifelong love of the game. “Our excitement stems from the huge number of benefits which the scheme provides. 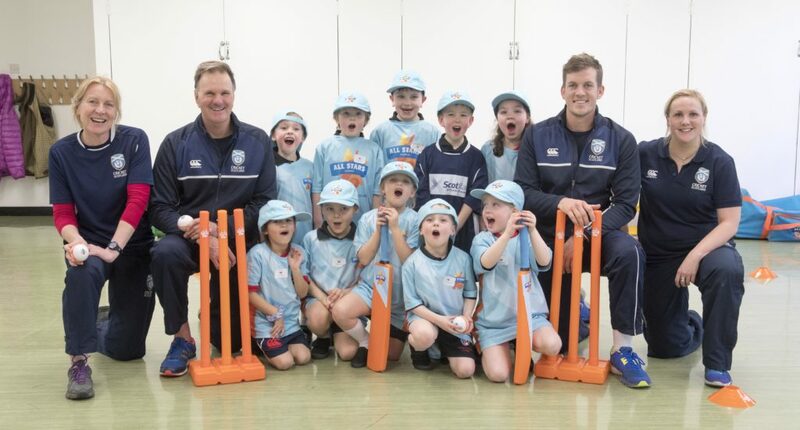 “As well as the personalised participant pack sent to each child’s door as part of an easy online registration process, All Stars Cricket involves nine out of 10 fundamental movement skills, is fun, safe and inclusive and gives the children the chance to rub shoulders with the elite players in Scotland. “We think this makes All Stars Cricket the leading entry level sports programme in the UK.